There is not all that much I can say about this pen. But I will try - It is a M300, plain-Jane black with gold trim, it cost the least of any Pelikan Souverän model I own and, this occasion marks the first time that I have had three M3XX pens in rotation at the same time. 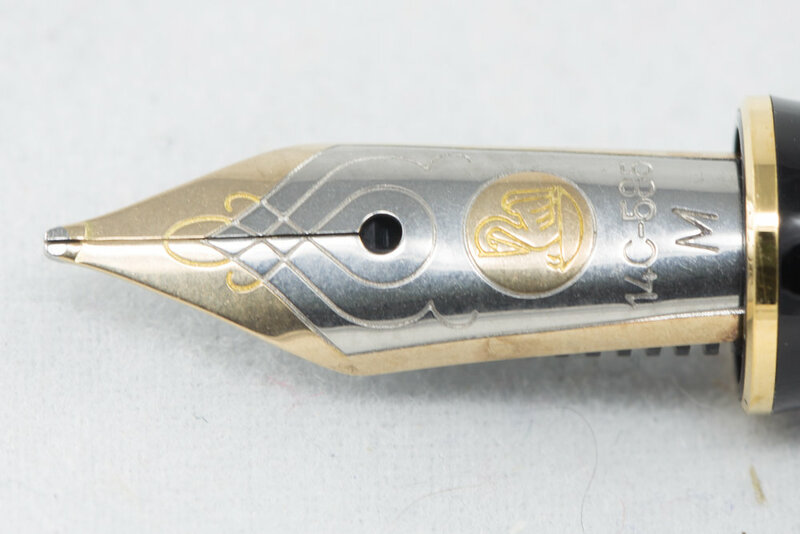 Like the pen I struggle to say much about this nib. It is fairly old (two chicks) a medium width and works. Sometimes an ink will surprise me. I can't remember what it was like when I last used this ink some two years and one ago, but this time wow. It is a very dark blue black that sheens red in all the heavy ink sections. Shading is fair from this medium nib but would be better out of a broad stub. Noodler's are not noted for sheening inks but this one is the exception.